Maddy Rawlings on doing it yourself, or doing it ethically. Meet Maddy - she's one extremely talented individual. When she's not dreaming up incredible new designs to help take brands to the next level (watch this space with EME), she's busy turning pieces of fabric into simplistic yet timeless garments and creating adventures guides. 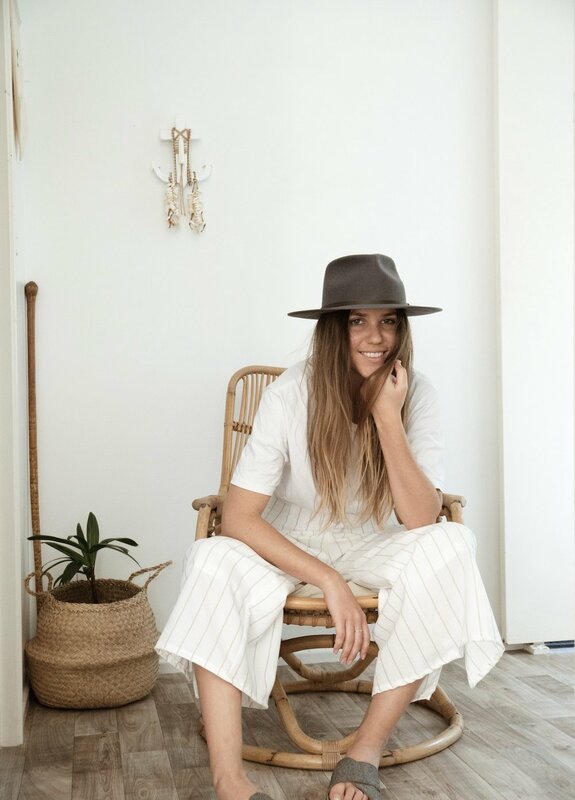 She runs DIY workshops in the Gold Coast and posts these same creations with easy to follow steps over on her website, The Essentials Club. Continue on to learn more about Maddy and why she started The Essentials Club, alongside her sources of inspiration and her must-watch docos. What made you start The Essentials Club? There’s a lot of reasons that drove me to start TEC but I’d say the main journey that led to turning it from an idea into a reality was to hold myself accountable and make the time to get creative without constraints. I’ve always been a hands on creative and with a job that now has me glued to a screen all day I felt I was beginning to neglect this crafty side. So, by having a platform that has a deeper meaning by sharing these processes and helping others on their resourceful and creative journey I now find myself properly setting aside time to get making whether it’s just for fun or something practical! When did you first start creating your own pieces? Do you use a pattern or just go off something you see? Ever since high school when I learned to sew I’ve always been dreaming up garments and then bringing them to life. Sometimes it’s seeing the potential of a second hand item and evolving it something that’s more suited to my style. Otherwise, most of the time I’ll create something that starts off as a very rough sketch then by using measurements and fits of similar garments I’ll begin a process of trial and error to get it to a point where it looks and feels right. This piece will then become a starting point for the next time I want to create something like it. How do you source the fabrics you use? I enjoy the process of physically going somewhere and seeing/feeling the available fabrics. Sometimes I’ll have an exact colour and material in mind for a garment, other times I’m open for what I come across in the moment and think will work. My main sources of fabric at the moment are The Fabric Store, Johnno’s Fabric in Maroochydore (a small family run store) and every now and then I’ll score at op shops. What practical tips do you have for those of us who are yet to DIY our own clothing? Ideally go to a workshop/class or reach out to a friend who can help guide you through making a garment. If you’re doing it for the firs time it’s so handy to be able to turn to someone who can talk you through any problems/queries you might face. As much as it is a creative outlet it can get quite technical. Also, don’t put too much pressure on yourself to make it perfect. Take it slow, take it in and enjoy the process. Sewing is an incredibly rewarding skill that you’ll only get better at the more you do it! The thought that I’m somehow making a positive impact by helping people explore the idea of making their own clothes and take a more intentional path keeps me motivated. It’s crazy how aligning with who I truly am has helped attract more resourceful, creative and inspiring people/opportunities that make me absolutely light up with purpose all because I followed a passion of mine. Follow your passions because the two scenarios are it either all works out or you take away what you can and learn something from it. To me that’s a win-win situation. Do you have a morning routine? If so, what is it you do to set yourself up for the day ahead? My biggest morning ritual is finding that first hit of caffeine. I’m honestly not one for a set in stone routine, I’d rather wake up see how I’m feeling, what the day is like and adapt to that. Sometimes that means an early morning walk, getting a start on work, making an epic brekky or just snuggling up. One thing I make sure I do if I’m working and to help with productivity is take the time to slow down, visualise my day ahead and ask myself what do I want to achieve. Success is not a final destination. Every time you think you’ve hit your definition of success it continues to evolve. So, no matter what you’re doing take in the journey, be authentic and don’t neglect yourself or those who love you. Because there’s no point reaching this idea of ‘success’ and having no one to enjoy it with. Is this the part where I admit I’m more of a podcast gal. I’m halfway through about 4 books so I’ll let you know which one’s a killer once I’m finally finished one. But to give you something to takeaway I’m currently obsessed with everything Seth Godin produces. I love the way he questions conventional ideologies in business and marketing and encourages people to make decisions based on impact not stats/like/trends. He just has such an interesting and refreshing outlook on everything (hence the advice earlier being from him). One documentary everyone should watch? Why? This question got me real good. I have so many favourites for different reasons. If you want a good slap across the face to give you more reason to refine your lifestyle and environmental impact then watch Blue, Minimalism or The True Cost. I also love connecting the dots as to how people, places, cultures, business, etc came to be what they are today and that’s an endless list of inspirational documentaries depending on what category you want to focus on – I find it’s such a good eye opener that just because we live a certain way doesn’t mean it’s the only way. Are there any other Movers & Shakers out there in your world that you think we should all know about? Check out The Essentials Club here. Why Kmart & Marie Claire’s recent piece: ‘what to buy to create the perfect (and ethical) capsule wardrobe on a budget’ is nothing but greenwashing.